nParallel created virtual reality driving trainings with Bridgestone to showcase their brand and tire pressure monitoring solutions. As one of the most well-known tire developers, manufacturers and sellers, Bridgestone is founded on serving superior quality products. 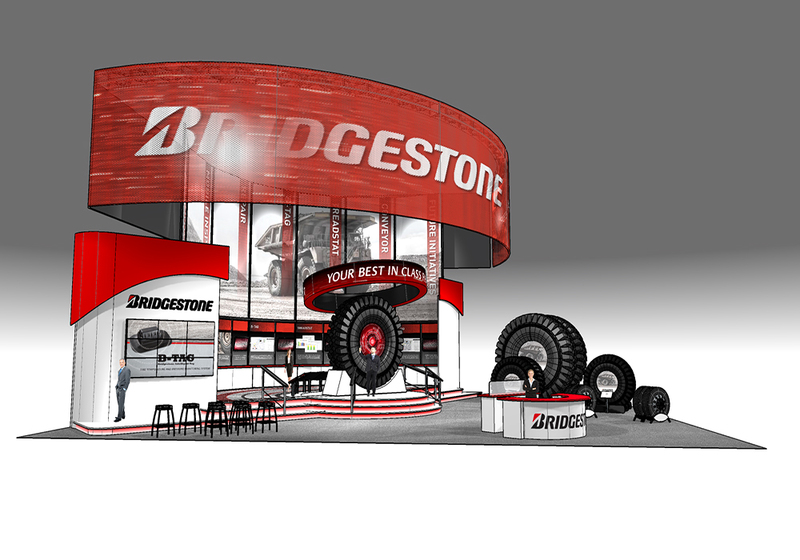 Bridgestone used MinExpo (the premier trade show event in the mining industry) to introduce a new product that aligns with their mission and focuses on total solutions. For Bridgestone, nParallel created virtual reality driving trainings with the goal of reinforcing their tire pressure monitoring solution. Because MinExpo is such a high-volume show, it was important to ensure the attendees didn’t get lost within the layout. To prevent that from happening, nParallel created a large, curved LED screen to generate excitement and visibility that could be seen by all booth visitors. nParallel also created a 13,000-pound tire display and provided Bridgestone with service gallery elements and a storage room. nParallel utilized expertise in I&D labor, supervision, LED coordination, graphic design and show services to create a unique design with a custom look and feel.